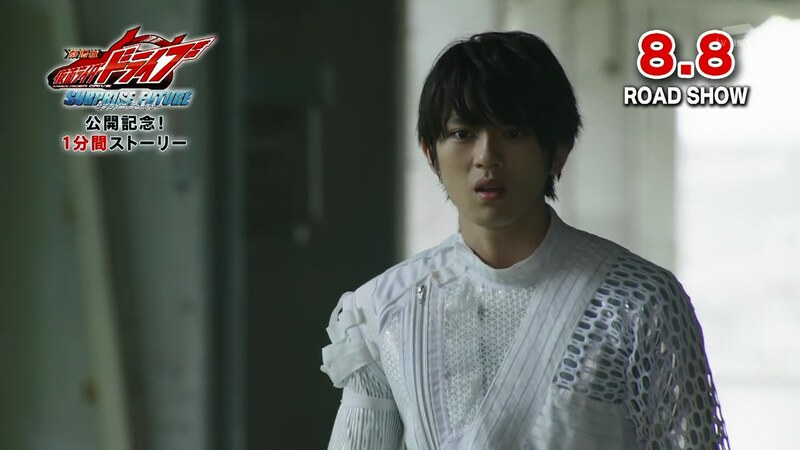 Recap: Kamen Rider Drive, Episode 40 – Why Did the Two Gifted Scientists Clash? Gou ditches Heart and hurries to look for his Shin-niisan. He helps him up just as Heart walks up to tell them they’ve been fooled by Banno merely to obtain Krim for his own twisted research. Heart says Banno is the most evil being he’s ever known. Gou is outraged, but Heart explains. 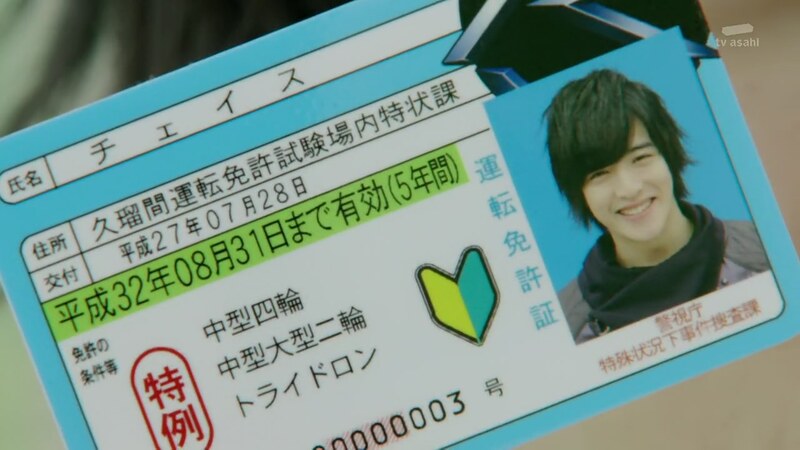 It was 15 years ago when the Roidmude were already at a level of intelligence close to humans. But Banno wanted to enact revenge against a young entrepreneur who refused to fund his research. To do that, he had 002 copy that human form just so he could torture a being with the same face in the name of research. Krim was absolutely against this and decided to end his relationship with Banno right then and there. 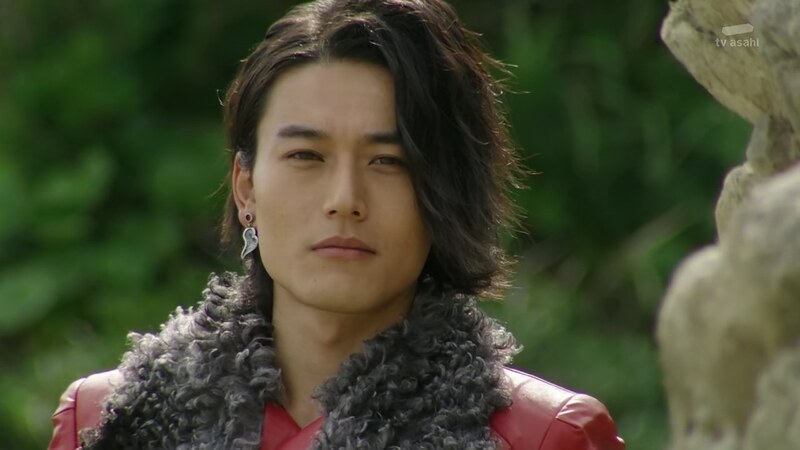 Banno then programmed the evil heart of humans into the Roidmude which ironically caused them to evolve above humans. 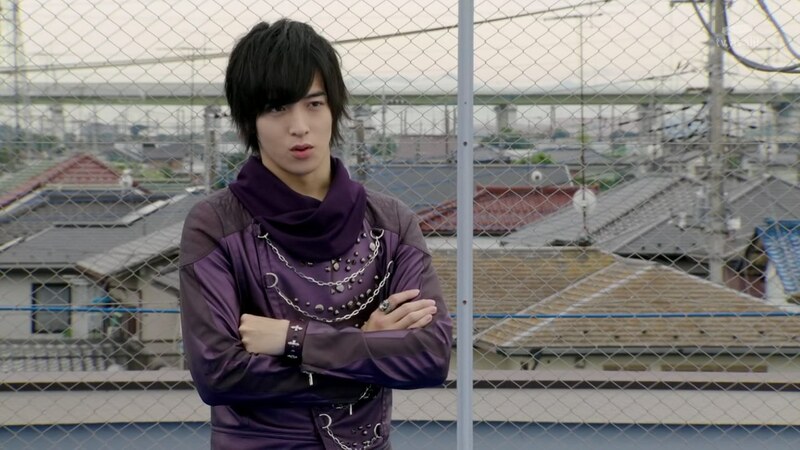 Because of all this, Heart was resolved to keep this form to enact his own revenge on not only Banno, but all of humanity. Gou can’t believe it, but Shin-niisan says Kiriko recounted the same thing. Earlier in Tridoron, she remembered how her mother always had a sad expression whenever asked about Banno. That is why she was willing to trust Krim. Gou tries coming to terms with the fact that he was just being used by his father. Heart says he won’t call them “foolish” as he also understands the feeling of being disappointed in one’s parent/creator. 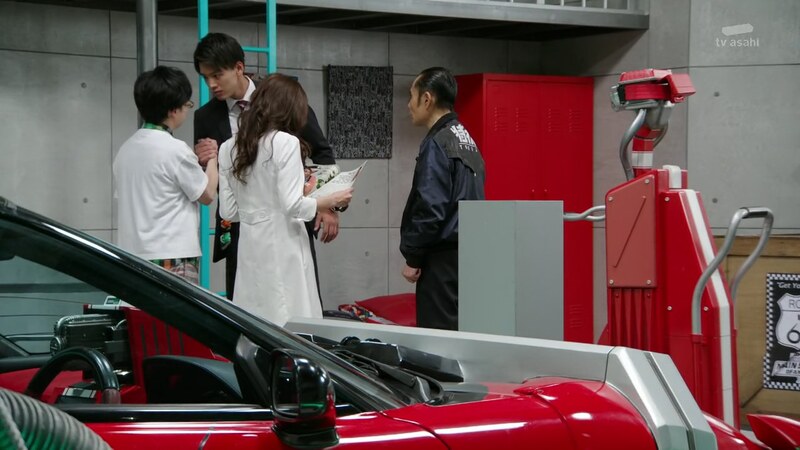 Meanwhile, Tornado has whisked Kiriko away and 004 has brought Krim to Banno who is ready to use the data he’s stolen from The Pit to build his own Drive Driver. Just as Krim wakes up while Banno works on him, Shinnosuke arrives. 004 tries to fight off Shinnosuke, but he manages to knock him off to give him enough time to grab Belt-san. Shinnosuke runs over to the tablet, but Banno is no longer there. Banno is now inside his own Drive Driver. 004 takes him and they run off. Anyway, Belt-san says Banno is just another addition to the list of their enemies they need to stop. No worries. Shinnosuke says that’s what’s up. He trusts Belt-san’s sense of responsibility to atone for his sins, even after death. That is the complete opposite of dumb Banno. They head back to The Pit. Kyu has just found an old magazine that ultimately reveals Tornado/George Shirogane’s ultimate ambition, to have the most beautiful necklace he’s designed on the most beautiful woman’s neck in a most beautiful church beside the ocean. 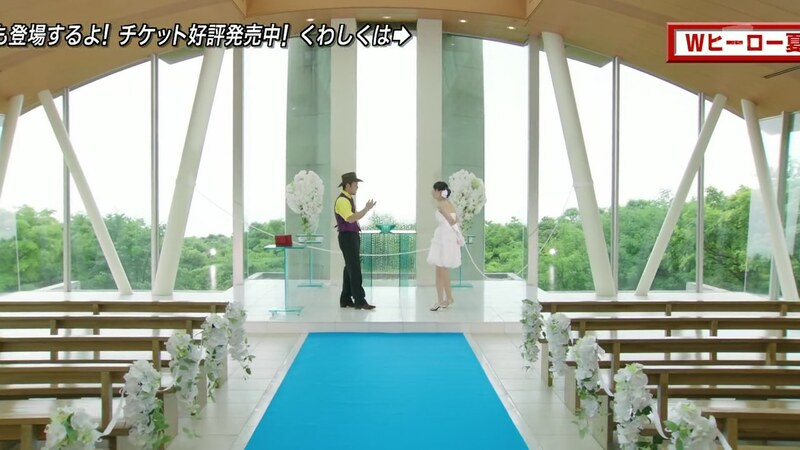 Shinnosuke hurries over to the church where Tornado is ready to force Kiriko to marry him by having her wear a necklace. 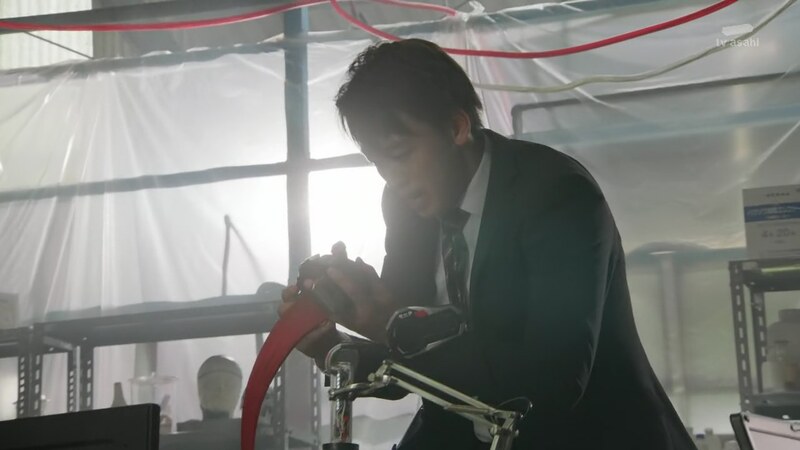 Shinnosuke uses a Shift Car to knock and destroy the necklace out of Tornado’s hand. Tornado admits the real George, a cocky narcissist, is dead. Even if his ambition was lame, he could relate. Shinnosuke henshins and they take their fight out to the seashore. Belt-san says to go Tridoron, but Tornado stops them. Gou arrives to help and expresses his resolve to crush all evil, even if that evil is his own damn father. While Gou and his Shin-niisan tag-team against Tornado, Kiriko’s knight in shining armor Chase arrives to save her once again. He says he will back the guys up with Tridoron. He’s got his license now. Shinnosuke and Gou hop onto Ride Booster’s flaps and the three of them together defeat Tornado. Gou thanks his Shin-niisan as Heart watches. 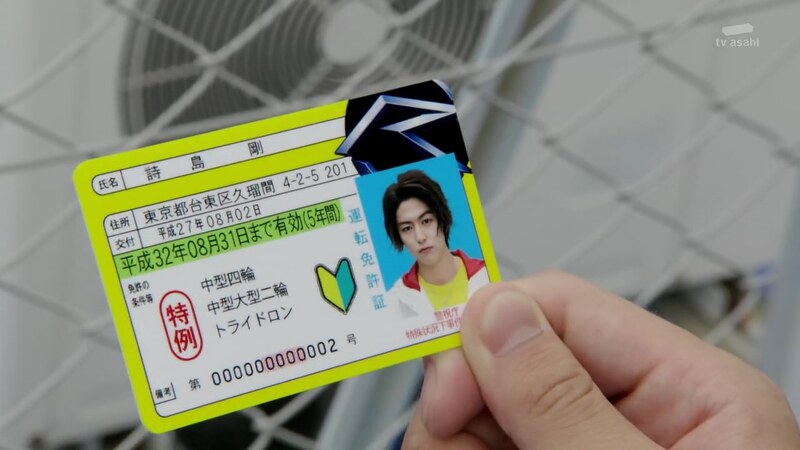 Later, Gou has gotten his license too. Belt-san asks how he’s doing after what happened with Banno and Gou says he’ll just have to push forward. He’ll follow through on this like Shinnosuke followed through on Papa Tomari’s case. Kiriko hugs Gou and says she knew he’s always been strong. 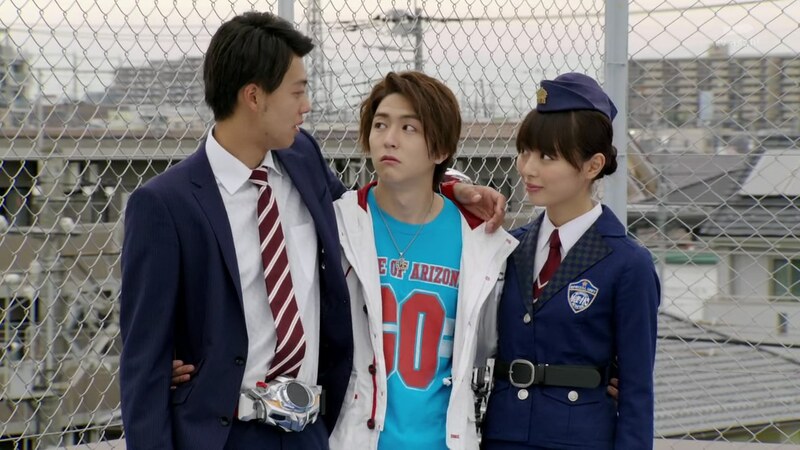 Shinnosuke says Gou is definitely the little brother he’s proud of. He walks over to hug him as well and welcomes him back. Chase comments on how family isn’t just something that brings one pain. When asked to clarify, Chase says Shinnosuke and Gou just look like real brothers. That’s all. Shinnosuke is surprised Chase has dropped the “Tomari” when addressing him. Chase leaves and tells himself that he’s learned a lot since meeting them. Humans, families… he will risk his life if needed to protect them. Meanwhile, Brain is excited to have his body back. But why was Medic so willing all of a sudden? 006 appears and says it’s because Tornado/008 was killed. It’s time to finally gather the Promised Number and 006 wants to be the next one to reach Ultimate Evolution. Brain thinks 006 can evolve if he destroys Banno. That would leave only one more spot. Medic wants that final spot to be hers. Eiji runs and jumps into the Time Road. Dark Drive pursues. Half-baked, half-cooked, missing ingredients. Use any cooking metaphor you want. That’s really what Drive is. And this episode was another example. I mean, all of this stuff feels like it should’ve happened much earlier. Maybe even at the midseason climax. So Kiriko suddenly remembers her father was a jerk? Um… okay. But they had no idea what his line of work was? I find that hard to believe. Otherwise, how would Mom have decided to leave him (as Belt-san presented in exposition). And why would Kiriko be so inclined to join up with Krim? So she knew Krim or not? It feels like a huge retcon. We finally learn how the idols got their human bodies in the first place. But really, we should have had whole episodes dedicated to each of Heart, Brain, Medic and even Chase exploring their “births” and the humans they copied. That’s four easy plot episodes right there that also add to the villains’ story and character background which has been sorely lacking. They wouldn’t have ended up being so paper-thin. This Tornado 2-parter was pretty pointless other than to reveal Banno’s true intentions. 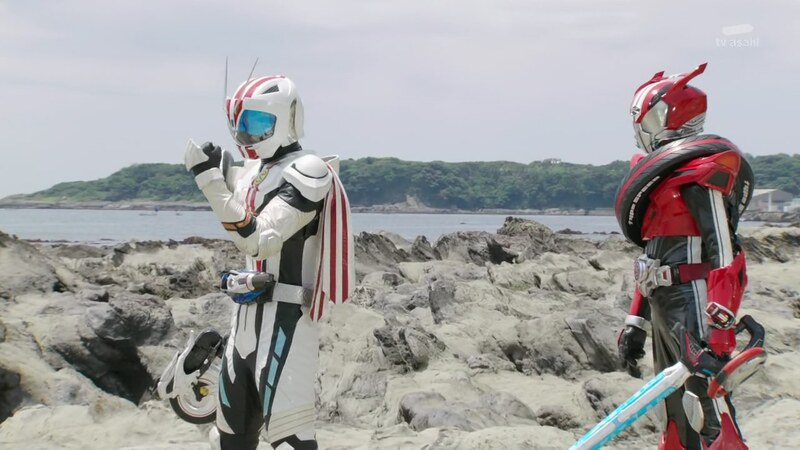 Which brings us to talking about how Gou’s story and struggle is much more suited to be the main Rider/character’s story than Shinnosuke’s story has been. Either switch Gou/Mach and Shinnosuke/Drive as the central figure and work from there or give Shinnosuke this whole “daddy created the Roidmude” story instead of Papa Tomari being some random police officer caught in the crossfire. Oh wait, Papa Tomari wasn’t just some random cop, he was “special” for some reason or other. Chase learning to be human would be great too if 2/3 of his story wasn’t about Kiriko crushing on him. Anyway, this episode is also another example of how much they’ve dropped the ball. So much wasted potential, it’s crazy! ← Recap: The Amazing Race Canada 3, Episode 5 – "I have buried my daughter semi-alive. " 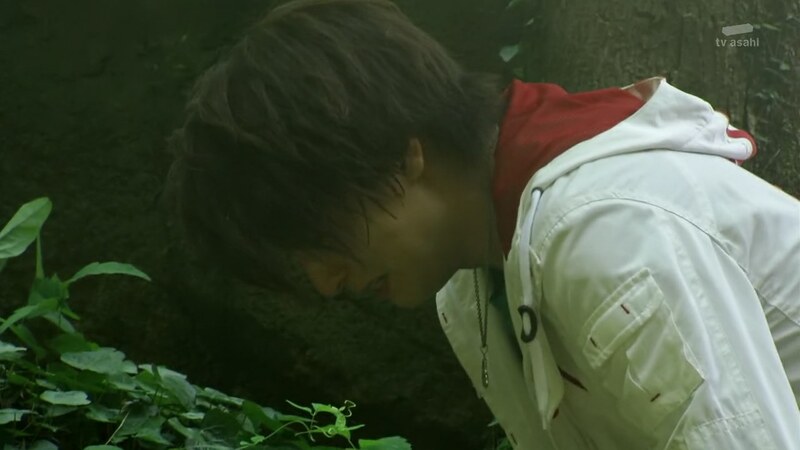 Banno’s backstory would have actually been interesting if they had spun it into a full one that looked into the contrast between his growing dehumanization against the roimudes’ quest of gaining human emotions. Heck, that little episode with Rinna and her scientist BF could have actually been a good start for exploring Banno’s character. But nooooo, they just have to go squander the story somewhere else. Just like every other roimude case other than Heart’s Brain’s, and Medic’s bear little or no connection to the current plot. It feels like the first half is unnecessary filler. And I agree with you that Shinosuke as the main Rider feels very inconsequential to the plot, as his actions bare affect anything. Heck, that little arc about Papa Tomari now seems utterly pointless. Definitely. Banno didn’t even exist for more than half the season.